(1) Instead of including a to-do list, I am including a list of accomplishments for the past week. I tend to have an on-going to-do list in my calendar, and having it here just seemed a bit redundant. But I love looking back at my accomplishments, even if they weren’t on my to-do list to start with! (2) I’ve also changed my “On deck with the Kiddos” to “Our language goals for the week” – we really want to focus on all of making some progress on Spanish, so we’ll see how that works for us. (3) Finally, I’m linking up for the first time to Monday Coffee with The Move to America – this is just a chance to enjoy a bit of fellowship with others. I need some expat blogging friends, and I’m excited to see what the link-up has to offer! And I was totally lazy for his 5th birthday last week! I am two weeks into my Fuel Cycle (down about 3 pounds, and continuing for a third week for the first time ever! ), so this menu is another Fuel Cycle menu. Meals here follow Trim Healthy Mama guidelines for the Fuel Cycle, but I’ve only got 2 Deep S (= Satisfying) days instead of 3 since my Fuel Cycle ends on Saturday. I’ve still got 2 FP (= Fuel Pull) days, and 2 E (= Energizing) days. Sunday – my Fuel Cycle is finally over! Sn: Ricotta creme, satisfying sundae, nuts!! I’m also linking up to Trim Healthy Tuesday over at Gwen’s Nest and Stacy Makes Cents – come on over and find all kinds of other things to put in your mealplan! I really like the idea of listing your accomplishments instead of your to-do list especially since I think I didn’t manage to get one thing on my to-do list done last week but I did accomplish other stuff (sure wish I could remember what it was!). Hope you have a great week! That was much of my reasoning, Jean – I had a productive week, but the productivity was not in the direction I had planned! First I love how you are making your weekly plan work for you! That’s the whole mind set behind this link up was to encourage others to set a plan that works for them. It just makes me giddy to see you going with it. I love the idea of a accomplished list instead of a to do list. And I love the Spanish goals, I think it’s so cool you are actively teaching your family Spanish. I am going ultra lazy this year on the Kyla’s (my oldest) birthday and having a friend make her cupcakes. I just don’t have it in me. Happy belated to birthday Pooh. Thanks, Felicia! 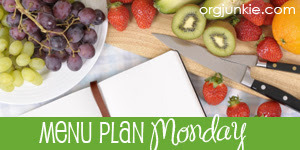 I love this link-up, because it really does help me get ready for the week! This reminds me – I’m hungry and need Cottage Berry Whip. Right now. Thanks for linking at Trim Healthy Tuesday…but I gotta go and make Whip now. Nice to meet you, Tina! I’d love to hear more about your life as an expat – heading over to check you out now!